It will protect your business against any potential issue with your customer. It should give your customer all the information he needs to buy and sale your products. Writing this kind of contract can be a daunting task. We created this tutorial to make this process really easy. By using this guide, you can be sure that your wholesale contract will be exhaustive, clear and precise. In order to make things even simpler, we also provide a free wholesale contract template at the end of this tutorial in word format. You can download it and modify it as much as you would like. With the help of this template, you should be able to get your contract ready in a short amount of time. In this tutorial, we will explore each part of a wholesale contract one by one so that you have a clear understanding of the utility of each section. Now, let’s dive into this guide! Selling on wholesale means selling your products at discounted price (usually 50% of the retail price). For this reason, you want to make sure that your wholesale customer is a valid business and not one or several consumers who want to take advantage of lower prices. 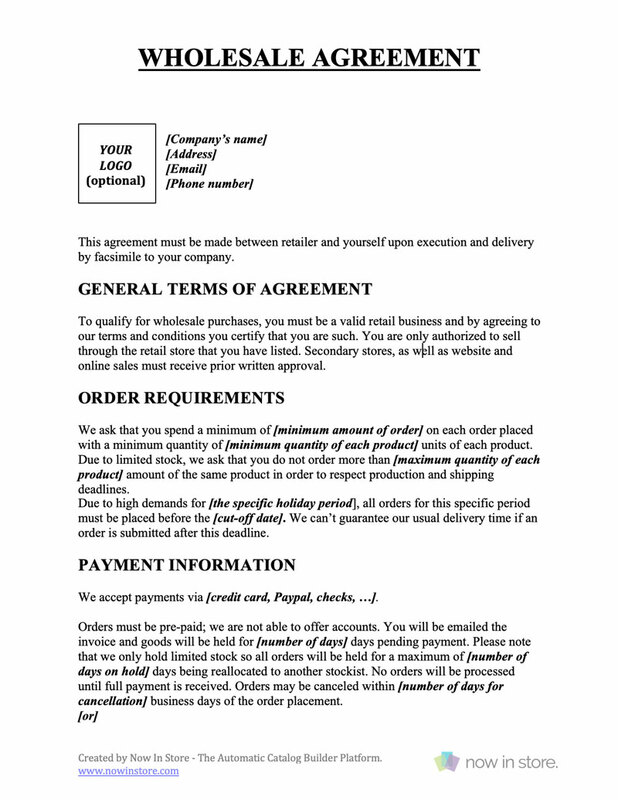 In this section, you will indicate that your customer has to be a valid retail business and that by agreeing to your conditions (and signing the contract) he certifies that he is such. You should also indicate if you are willing to authorize sales on other locations than the one available on the contract like secondary stores or online stores. Set a minimum quantity for the whole order or for each product purchased. Set a minimum amount for the total of the purchase in your own currency. But selling in bulk means more preparation time and longer delays . Don’t forget to take into account your own constraints so that you always meet the demands of your client. Failing to fulfill an order in time can be damaging to your brand and cost you a lot of money. In order to protect yourself from such disagreement, set a maximum quantity for the whole order or for each product purchased. Complete this section, by writing down an estimation of your production time depending on the size of the order. For busy periods like Christmas, it’s important to set a cut-off date after which you can’t take any more wholesale orders to meet the usual delivery date. Do you have any limitations in terms of shipping? If that is the case, write them down in this section as well. As you can see this part of the contract can change a lot depending on your own constraints. We tried to put several use cases in our wholesale contract template so feel free to remove or edit different parts depending on your own needs. Prepaid payment: This is the easiest and safest option for your business. The customer makes an upfront payment before shipping of goods. You don’t have to worry about cancellations. You will usually choose this option for your first-time clients and then move to one of the next plan for the following order but it’s pretty rare that your buyer will agree to those terms. COD (Cash On Delivery): With this option, your customer will pay upon reception of the good. This option is more common than the first one but is still rarely used. Net option: The usual payment plan is to request payment 30 days, 60 days or Net X days after the shipping of goods. This kind of plans is called Net 30, Net 60 or Net X. Most sellers used this method for their wholesale deals. A payment deadline after which your client’s order will be reallocated for a new order. A cancellation deadline after which the order must be fully paid. Some of your products’ prices may change in the future and you want to make sure that your customers are aware of this. So don’t forget to mention in this section that your prices may fluctuate without prior notice unless an invoice has already been issued. In this section, you need to indicate an estimation of your shipping costs and shipping delays depending on your customer’s location (local or international). 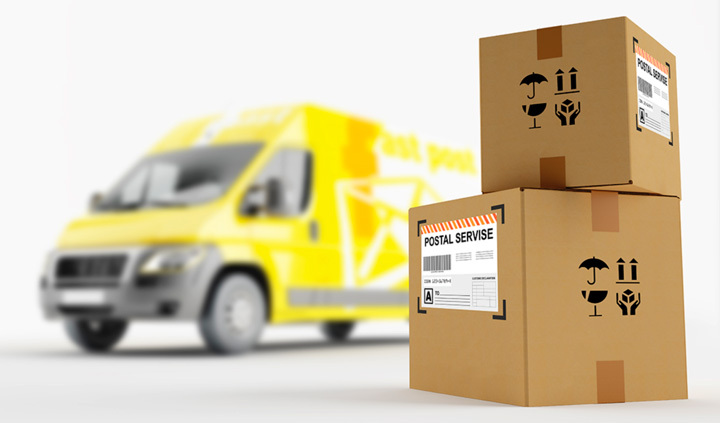 You should also write down the list of transporters you are using (USPS, FedEx, UPS, ePacket, …). Sometimes it may be really difficult to give an estimation of shipping costs in advance if you don’t know the content of the order. In this case, just indicate that an estimation of the shipping cost and delay will be provided upon reception of the order based on its content and the shipping destination. This section should also give details about your damage claim and return policy. Your customer wants to know what are his options if the package is damaged or when it’s arriving too late. Those indications should specify within how many days a customer should make a reclamation and how he should do it (by email, by phone, …) and what happens if he doesn’t meet this deadline. State a minimum or maximum percentage of your wholesale price that your user should sell your products at (usually around 200%). Set an MSRP (Manufacturer Suggested Retail Price) for each of your line sheet’s products. The advantage of this second solution is that it gives you a more precise control over the retail prices of each of your product. 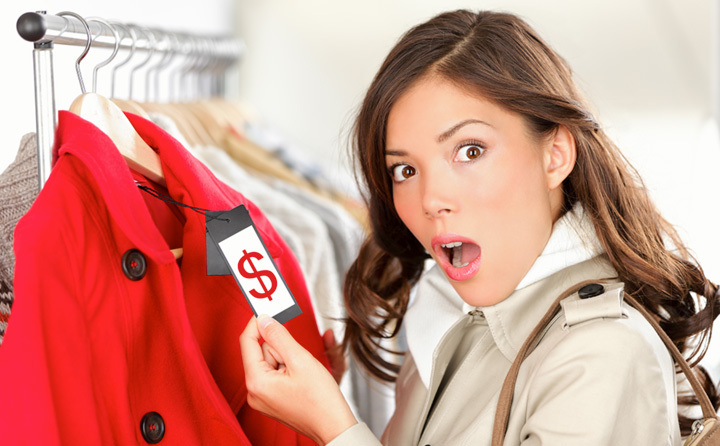 If you want to give the possibility to your customers to sell your products at a discounted price, you should indicate the maximum percentage below the MSRP price they can sell it for. This is a standard section in most contracts on merchandise. Here, you want to protect the intellectual property of your brand and business. You must clearly state that the content you created for marketing purposes like your website or images is your property and that other businesses shouldn’t use in an inappropriate manner without your written content. The goal of this section is to reassure your customer by stating that all of the information that he is sharing with you during the lifetime of this deal is strictly confidential and that you won’t share it with any third party for commercial purposes. In this last section, you will ask for your customer’s contact information and his signature. It’s important to his email and phone number so that you know how to contact him in order to update him on its order status or request any additional information. That’s it! You are now ready to create the perfect wholesale contract for your business. Don't forget to check out our wholesale order form tutorial which comes with two free wholesale order form templates that you can download, modify and use for your business as much as you would like. If you have any questions regarding this article or wholesale contracts in general, do not hesitate to contact us at info@nowinstore.com.